Leaving the hotel in full sunshine our route-book navigates us on to the open road but via the old city’s narrow streets, past the ceremonial and decorative Bab Mansour gates where traffic is being directed by the very smartly uniformed policeman and the roads are being swept by men with large palm fronds wearing high-viz jackets. 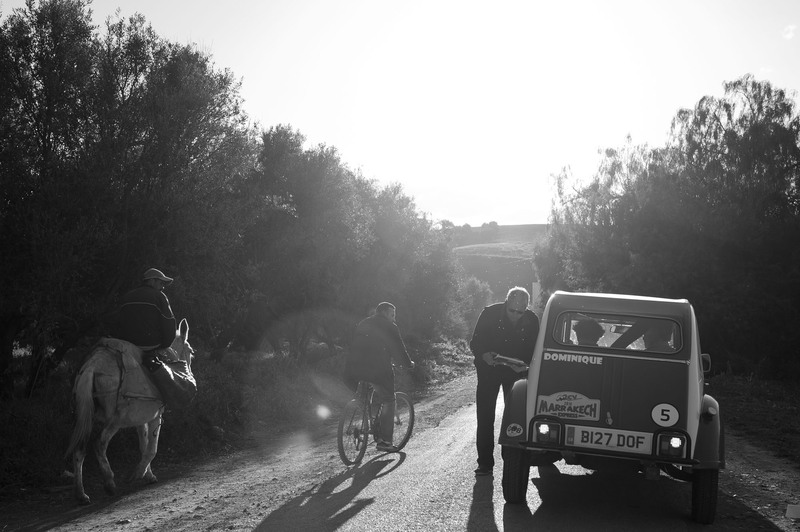 With the hub-bub of the City behind us, we head out fairly quickly into the countryside driving on what seems like a roman road and onto plains of crops including vineyards – possibly producing some of the very agreeable Meknes dry white that we had sipped the night before. The roads here are roman-road straight, eventually passing fields and fields of onions left waiting for collection, raised up on dry stone walls then packed on hay and left under plastic sheeting; waiting to be collected by farmers on donkeys or by one of the many open sided trucks containing an assortment of livestock or produce that you see trundling along the roads here. Then we start to gently climb through wide-open spaces, reminiscent of the Scottish highlands with evidence of snow in the tree-line. It’s here that we start to see more nomadic shepherds tending to their flocks and evidence of their homes against the rugged terrain. After this, the landscape becomes more densely wooded and you can see why guide books talk about this area being the Morocco equivalent of Switzerland. We head into Ifrane which has a very up-market cosmopolitan feel to it thanks mainly to the fact the King has a Summer Palace here. Everything is clean and manicured. The square has a fountain and plenty of hanging baskets. The buildings all look like chalets. The Von Trapp family could come singing around a corner at any time. A lovely pit-stop with many of the competitors commenting that it felt slightly surreal to be in a scene you would not necessarily associate with Morocco. There were plenty of smiles as both drivers and navigators started to relax into the journey and were able to take in their surroundings a bit more. Experienced and non-experienced rally-ists alike were becoming more acquainted with the joy and ‘idiosyncracies’ of the 2CV and they chatted away about this and the differences in calibration of their rally computers, and getting to grips with maintaining the average speeds required in the regularity events. 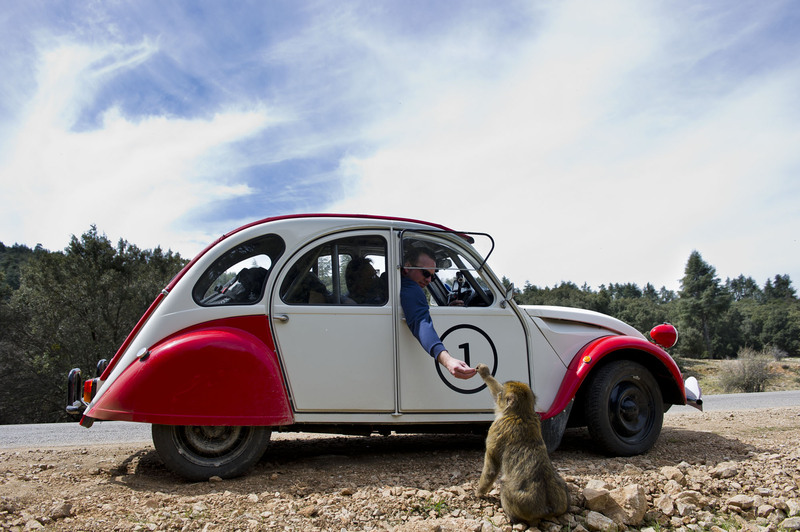 Twenty kilometres (also known as ‘clicks’) down the snow-littered road and to great excitement we started to get our first glimpses of the Barbary Apes. Very quickly the competitors (and soft-hearted mechanics) were proffering nuts and other goodies to outstretched hands. Horses in brightly coloured saddles stand idly by the road grazing while some locals offered little tagines and baskets to passers-by. 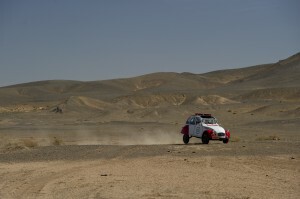 The afternoon regularity event near Ain Leuh started on a T-Junction with a hairpin bend on a hill that led the competitors higher into the cedar forest. Half the cars had arrived before the Time Challenge officially opened, so a couple of the competitors took the opportunity to get out their chamois leathers to clean windscreens and buff up the headlights. Then they were off, immediately on to a good climb on narrow roads through the forest and then out again onto a higher plateau. Even in this fairly remote area policeman could still be found – either talking it easy against a tree or officially standing in pairs at a designated speed trap. Further on we drove down into a valley with a little river running through it. On the bridge one shepherd seemed to be watching over not only his sheep but also the bridge and had set himself up as an unofficial ‘toll keeper’. With a spade in one hand, he could have come across as being quite threatening – but actually when we drew level he had a broad smile on his face and you could see that there was no malice intended. The traditional nomadic Berber’s huts here seem to be a wooden frame construction covered in heavy duty plastic or brown material. Managing to get a glimpse quickly into one as we drove past you could see it had been lined with rugs secured to both the walls and the floors, with a little wood burner in the middle of the hut. Simple but cosy and effective. Shepherds seem to spend a huge amount of time alone. 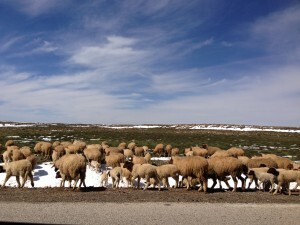 Without much in the way of external influences and certainly not an iphone or ipad in sight for them – one wonders what they must think about to while away the many, many miles of walking, moving their livestock from one area to the next. Moving southwards, the trees and the snow and general alpine feel gives way to lush green crops and fertile earth. We now pass olive and orange trees. It is whilst driving out of the cedar forest, down into the valley that we also start to notice a lot of very young children walking the roads, mainly in groups, possibly on the way to and from school. They seem to see the cars well in advance from their vantage points on the side of the road and start running en-masse towards them. We had to stop for four boys, not much older than ten or so who ran at speed into the middle of the road pleading with us to give them something. As it happened we only had a couple of chocolate biscuits which couldn’t go around so we slowly nudged on through with heavy hearts. But just around a corner was another boy on his own. We wound down the window and offered the biscuits. However he had seen my pen and insistently called out ‘Stilo!, Stilo!’ And again, louder ‘Stilo! Stilo!’ He was far more interested in this and thanked us for politely when we gave it to him. Once we had driven around a bend, we saw the other gang catch up with him and you could see there was much excitement over his new treasure. We spoke to a couple of the seasoned rally-ists about this later in the evening and the general advice is, although often heart-wrenching – it is often best not to stop. On we go, and the temperature changes slightly and the earth becomes redder. We pass through a number of towns between the end of the Cedar forest and Beni Mallal ( Khenifra and the smaller Tighassaline, Ouaoumana and El-Ksiba ) that look like they had just risen up from the earth, with the buildings (many under construction) exactly the same colour as the roads; each one a hive of activity. Men mainly, mill about the road – scooters and little tuk-tuks weave in and around pedestrians and larger trucks on the side. My husband thinks it has a similar feel to India but perhaps not quite as chaotic. Butchers displaying freshly hung lamb and goat trade next to the man that probably supplies most of the local farmers with their irrigation systems; selling metres of tightly wound yellow and blue hosepipes and metal baths. His neighbour is outside selling mobile phones and other electrical equipment. Many are dressed in the traditional Jalabiya, smiling and waving at the 2 CVs. 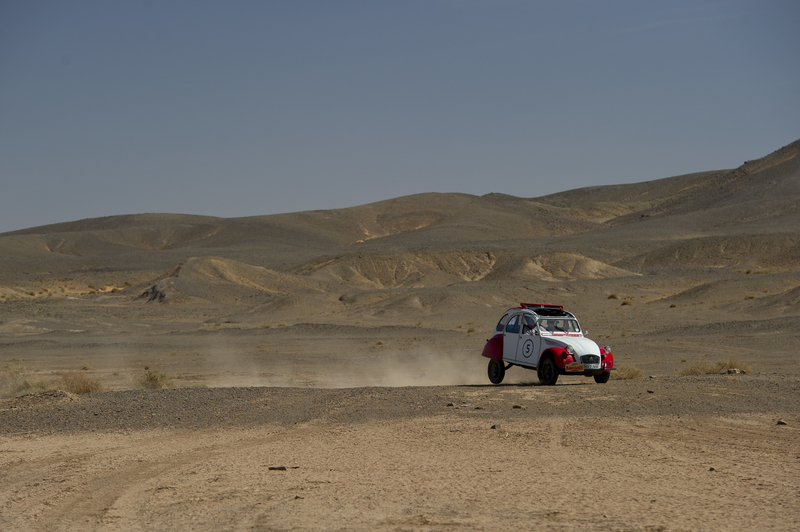 Levelling out, we drive down on to a fairly fast dual carriage way with the majestic High Atlas Mountains ahead of us, eventually turning off left and into our home for the night – the Hotel Ouzoud at Beni Mallal. Unfortunately the heavens really did open during our brief stay in Marrakech but a number of the competitors braved the weather and took a stroll into the Jemaa el Fna and to try their hand at bartering in the souks. A couple of others took the opportunity to go to the Majorelle Gardens (http://www.jardinmajorelle.com) that apparently were delightful, even in the wet. Many of the crew took the opportunity to catch up on some admin and other work thanks to having good internet connection and of course the mechanics were hard at work on a couple of the cars that required some attention. The camera crew started to edit their images and the video. In the afternoon the rain eased off and we took an early promenade past the impressive Koutoubia Minaret and gardens and into Jemaa el Fna. Around 4pm seems to be a pretty good time to go, particularly to sit out on one of the terraces with a coffee or mint tea and watch the square come to life below you. It soon becomes a kaleidoscope of activity with musicians, story tellers, snake charmers and monkey handlers gathering crowds around them whilst the food stalls busy themselves setting up for the evening. Not having a huge amount of time before getting back to the hotel for the 7.30 briefing, we still managed a quick pit-stop around a tiny part of the souk and did our fair share of bargaining in that time … returning with a few pairs of brightly coloured slippers, intricate brass ware and some fabled argon oil. In the evening we descended on the square again, which was now teeming with both locals and tourists coming to soak up the vibe, listen to the various stories being told and of course, eat. To get the most from the experience you need to be prepared to submerse yourself totally into the atmosphere and take some time to walk around and hear the patter from each competing stall before deciding where to eat. Apart from one or two men who seemed put out that we and others were not going to be eating at their stall, the rest provided good-humoured banter and added to the sense of theatre. Often when the stall holders realise you are English you will hear calls of ‘ Better price than Asda!’ ‘Cor Blimey my son’ ‘ Ducking and Diving’ and my favourite ‘ Alright my old China!’ Not brave enough to try the stalls offering brains and other offally-delights, and bypassing the snail broth stall, we plumped for one that; had the friendliest patter, had a good number of locals, looked busy and smelt delicious. As it happens it was stall No 1 and we found out it was owned and run by the warm and welcoming Aisha and her niece and nephews. We had excellent bread and dips (tomato and chilli and another garlic and herb) followed by vegetable tagine and delicious grilled meats and merguez sausages. At about 11pm we decided to go back have a quick birthday drink with John B in the Laurence Bar at the hotel, sipping delicious cocktails in this sumptuous bar was a lovely way to end our stay in Marrakech. 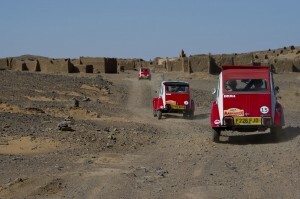 One word of warning – the beige ‘petit taxis’ should all have meters and they should all be on and working – if not just walk away or risk being stung for nearer 200 Dhirams for the fare on getting back to the hotel…. 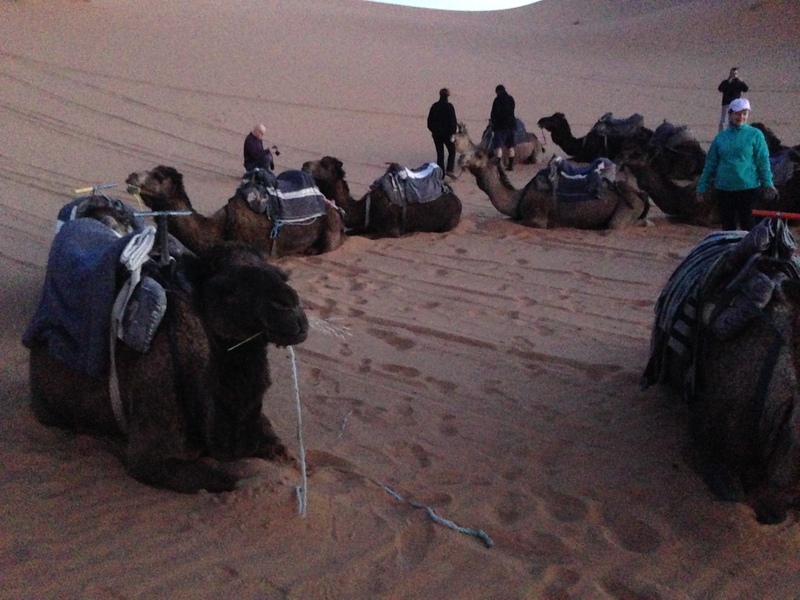 Other than that a brief experience of Marrakech was lovely. 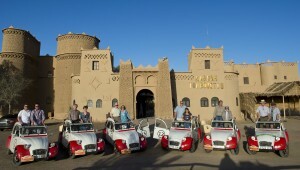 Whilst many might suggest staying in a more traditional riad, for the purpose of the rally the Palais Imperial was absolutely perfect due to the amount of secure parking that we needed. After a most amazing breakfast everyone was fully refreshed and fortified and raring to get back on the road for our journey on the old caravan route, up through the High Atlas mountains via the jaw-dropping Tizi-n-Tichka pass and eventually winding down into Ouarzazate, the film-making capital of Morocco, otherwise known as the ‘door to the desert’. Today was another long day of beautiful, breath-taking scenery and a little bit of drama thrown in. 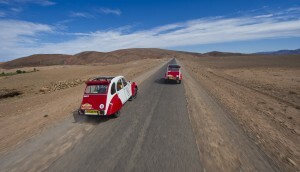 Climbing out of Marrakech and 47 clicks into our journey we started our climb on the Tizi-n-Tichka pass. This road, being the only main route between Marrakech and Ouarzazate delights and petrifies drivers in equal measures depending on your stomach for heights, roads with few barriers and lumbering five tonne lorries. It was nothing short of spectacular and is definitely not a road for the faint-hearted! There were many opportunities for some great panoramic views, although unfortunately places are limited to actually stop and catch your breath. At the official ‘viewpoints’ you have to jostle for views amongst a couple of coach loads of tourists and souvenir shops but somehow we managed to one-by-one overtake some of the slower moving vehicles eventually turning left off the main pass onto the road to Telouet and the Ounila Valley and our High Atlas regularity start. 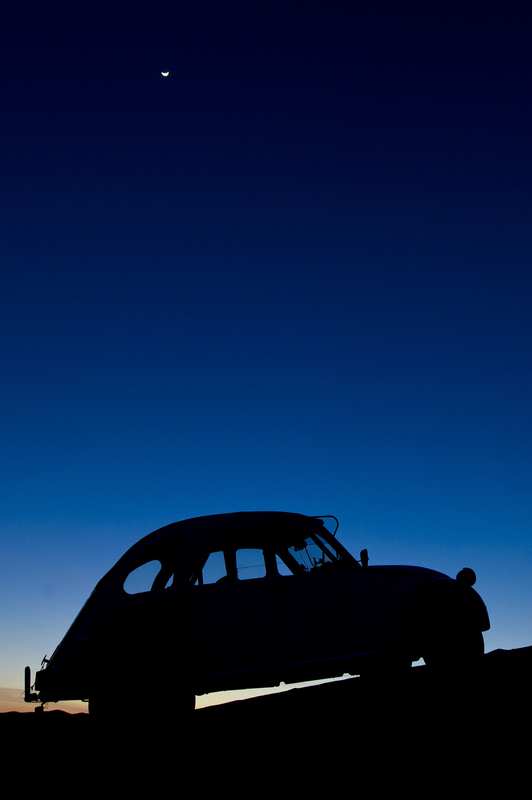 Immediately we regained a sense of remoteness and freedom. Certainly the competitors had relished the road so far with its never-ending switchbacks in a car that seems totally at one with the mountains and environment here. Nearing the Kasbah Telouet the colours of the rocks slowly merge from granite grey topped with slowly melting snow through to the rich red earth of more warmer climes. At times the scenery was almost Martian, with deep red imposing rock face and earth all around you, but then, on turning a corner you are confronted with a lush valley of palm, eucalyptus, poplar and mimosa trees. It was somewhere along this road, after the regularity event, that Reg and Michelle in ‘Daphne’ “came a cropper” with a local coming the other way. It was indeed a head-on but luckily, apart from being a bit shaken and stirred, no one was hurt. Apart from Daphne that is, who had more than her pride dented with a seriously crumpled zone on the front of her bonnet. The spectacle proved irresistible for a number of children on their way to or from school and by the time we rounded the same corner quite a crowd had gathered. 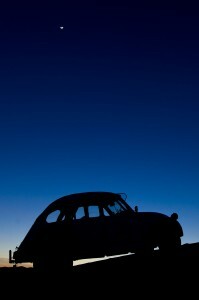 The ‘insurance man’ was summoned at great speed, an interpreter and somehow the deal was done on a dusty road on the way to Ouarzazate with the minimum amount of fuss. Reg insisted that despite the “big bang” it didn’t hit that hard – and although he did concede to be a little over the centre of the road (track) there was enough room on the inside to “get a truck through”! After a little negotiating and hand-shaking the local left with a slightly damaged old merc and 650 Euros in his back pocket which everyone seemed very happy with on both sides. ” This is what’s known as a result” Toby declared, and we all went on our way in search of Laurence of Arabia via our lunch stop at a little place near Tournat with some competitors pressing on to Ben Haddou some 70 odd kilometres down the road or only stopping once they had reached our destination of Ouarzazate. 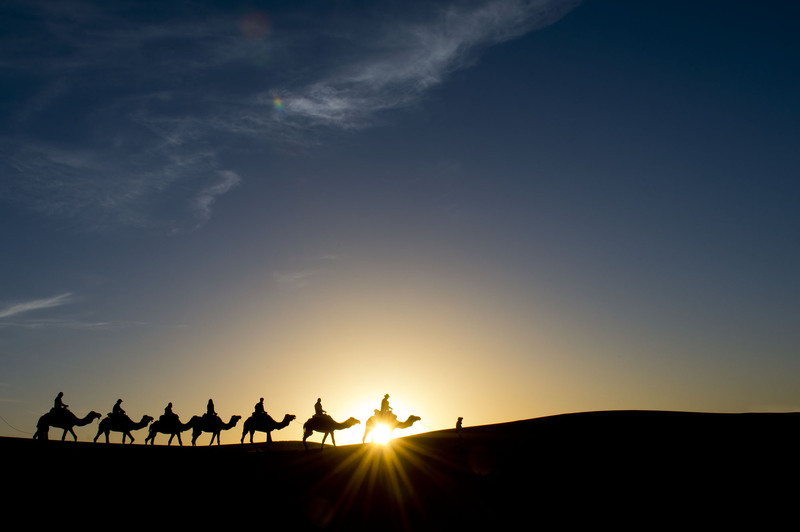 It was this last section of road through many little Berber villages that I really began to feel that I might bump into Laurence of Arabia or Jesus of Nazareth, both filmed in this area and also got my first glimpse of a camel. Very happy days! 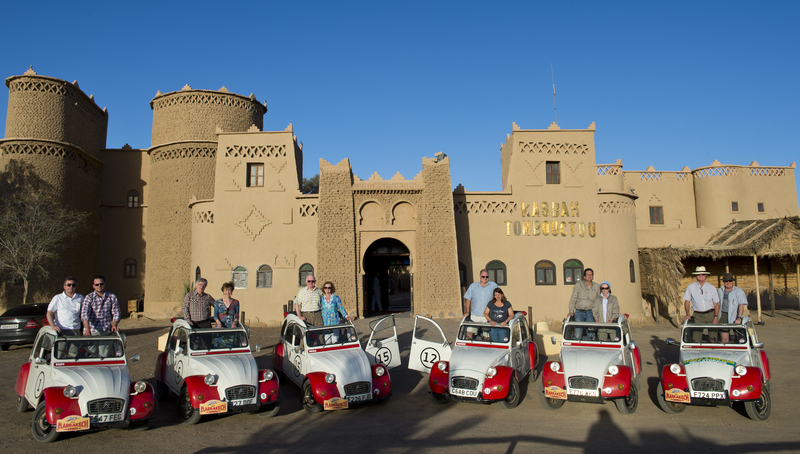 We arrived at the Ouarzazate Berberer Palace in good time, although sadly just a little too late for the tour around the Studios – and met up with the competitors who were ecstatic about the days driving. Although there had been a few frustrations about the section of road that was chosen for the regularity section everyone had by now fully fallen in love with their cars. At the 7.30 John T explained that as there had been a bit of a prang and one car was now off the road, they had decided to cancel that days stage. Some were probably a bit more relieved than others, but notes were pleasantly swapped about the respective handling of the different cars and all the competitors seemed to be completely blown away by how nimble and flexible they are around mountain roads. As we sat down to an excellent buffet meal including the most delicious beef tagine that was sweet and succulent, we talked about the marvellous views they had seen out of their windows (when not trying to maintain their 50.5 kph average speed during the regularity event) and what a joy Morocco is generally. 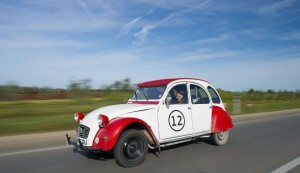 John and Judith Rowe, an experienced team (recently back from the Trans Am rally) seemed to be seriously considering buying a 2CV when they returned to the UK, with John saying the car was ” bloody good! 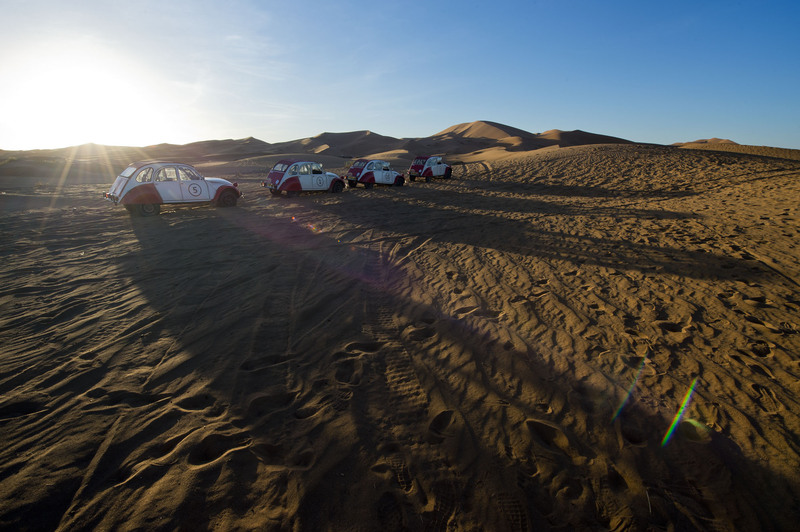 … the car has surpassed all expectations” explaining how it “flowed” and was an excellent choice of car for this particular route. Nicholas Pryor and Lesley Stockwell, also regulars on the rally circuit were poetical about the “absolutely amazing drive that day” loving the views from the “top of the Atlas mountains, the scenery, the lovely, lovely climbs and the people”. Over a few well deserved drinks, Reg and Michelle reassured everyone they were absolutely fine whilst the mechanics got to grips with the task of rebuilding damaged Daphne which included completely replacing the engine and the gearbox, making good and hammering out the bonnet. By the end of the long night the lovely Daphne had most of her beauty restored and the only real evidence of the little skirmish on the mountains, was a green bungee cord in place over the bonnet, and even that she managed to wear with pride, almost as a badge of honour. Toby greeted us in the morning with a cheery “hello” telling us that ” the boys did an amazing job last night putting in a new engine and gearbox ….bashed everything straight and made her look a bit more respectable!” It was good to hear. With 377 kilometres to drive today, it would have been a great shame for Michelle and Reg if they had to travel in the crew cars. So we had a good early start out of Ouarzazate and after some fairly flat desert road into the Draa Valley following the river and lush date and henna plantations passing the occasional imposing Kasbah along the way. Our first time control was just outside the village of Agdl where again we attracted a lot of interest from a group of boys wanting to play football on the road. 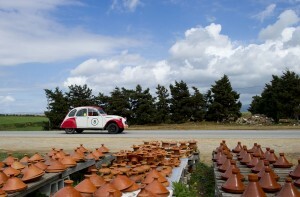 In my broken French I explained that some ‘petit voitures’ would be coming along the road shortly ‘vitesse!’. They decided to hang around and see for themselves and found a good vantage point on a bank parallel with the line we had drawn on the road. There was much anticipation. Daphne, resplendent with her new green bungy pulled up and after a quick exchange of paper work and times being jotted down pulled away from the line to cheers from the small crowd. Alastair and Hayden, arriving a couple of minutes later also did not disappoint, not only did they straddle the line neatly and expertly (of course) but they also did it to the sound of The Rolling Stones pumping through the open sunroof. Everyone passed through the regularity event to increasing excitement of the watching boys, who eventually went back to their business kicking a football down the road chanting “Chelsea” “Chelsea” in boisterous tones. Turning off the main valley road that would have taken us down to Zagora we continued eastwards, stopping for lunch at the delightful Restaurant Auberge Enakhie where we ate Moroccan salad and soup overlooking regimented palm groves. Some drivers took the opportunity to do a spot of sunbathing next to the very inviting swimming pool. After lunch the scenery became more arid. With some fairly long (and fairly boring) roads. 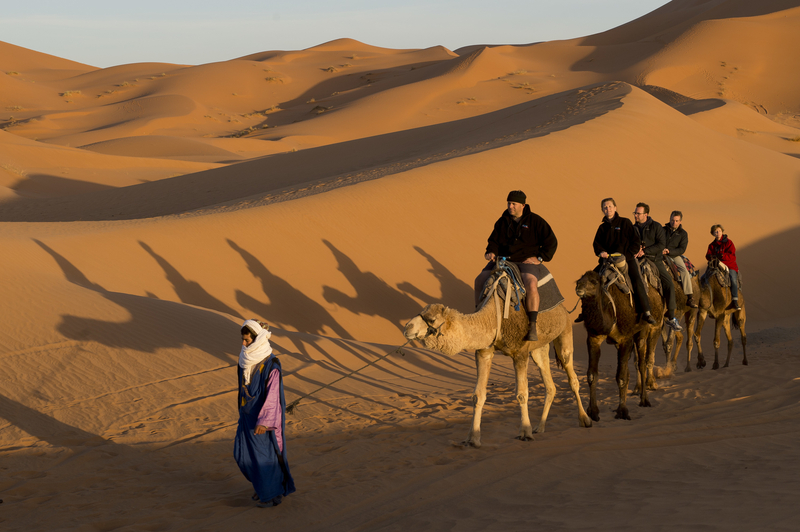 However as each mile passed through villages and towns hewn from the red rock looking like something straight out of Star Wars, so our excitement increased about getting to our desert camp at Merzouga. 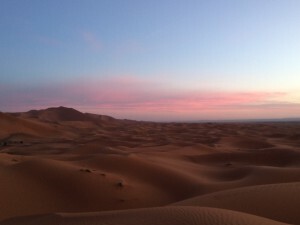 We had heard a couple of days ago that the UK was suffering with bad air quality as a result of Saharan dust swirling above the South of England, making air pollution a real problem; as we climbed across the desert on windy roads we were starting to get a sense of those winds. 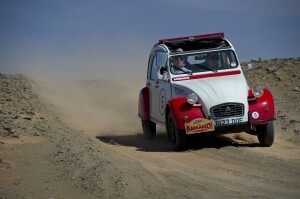 The 2CV’s were being buffeted around a bit, but they were doing well. Because it is so rocky, with sparse vegetation, until you try to open the car door it is impossible to get a sense of how windy it actually is. 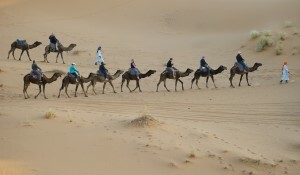 Yet still we passed lone nomadic Berbers going from A to B – often sitting on donkeys loaded with crops, wrapped up against the elements. You start to see that the traditional dress is also completely practical – keeping the extremes of both wind and heat out in order to go about daily life. The road fifty clicks away from Rissani is a long stretch of road that was blighted both by huge pot holes and something else quite shocking – rubbish. Thousands of plastic bags littered the area giving a new meaning to scrubland. Disappointing, shocking and a stark reminder to all of us about how ‘modern living’ impacts us all, everywhere. Eventually the Erg Chebbi dunes stretch to the right and in front of us so we turn off the main road and start to follow a track (and our GPS particularly) out into the desert. We passed through a deserted mining outpost and into what can only be described as ‘moonscape’. Looking ahead the horizon seems large and infinite and yet somehow two-dimensional at the same time. Sometimes we seemed to be heading towards a great cliff of rock in the far distance (the border with Algeria) and other times large dunes loomed up in the middle-distance. Time and space are a bit distorted here but we seemed to be driving for longer than we had anticipated before getting to our camp. 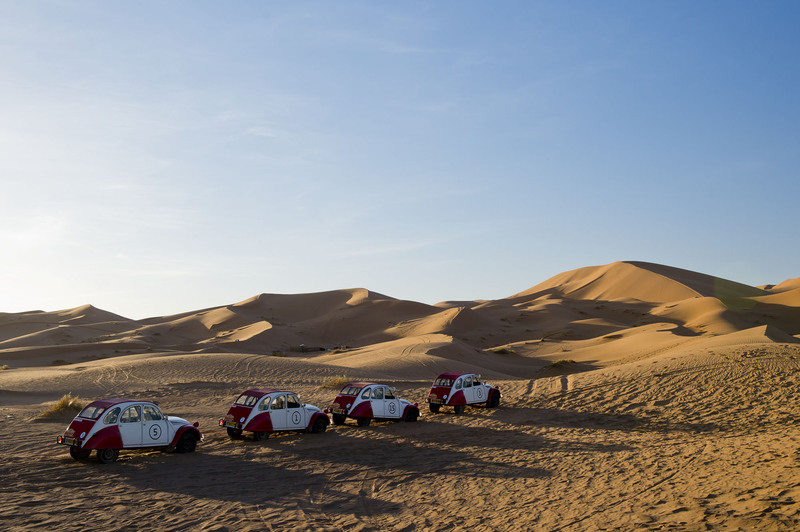 According to our GPS we should have been reaching our destination point – but actually we had arrived at well, nothing – no camp, no 2 Cv’s … nothing. Now was an unfortunate time for our GPS to have gone on the blink and we started to feel quite alone in a vast expanse of rock and sand. Without any immediate points of reference it would have been quite easy to have got completely and utterly lost. Luckily the GPS was still showing our route out, so it was quite easy after a slight feeling of mild panic on my part as the navigator, to retrace our route and get back to the little deserted ‘village’. Whilst trying to get our bearings without the use of any technology, it was with absolute joy that we saw John and Judith come to our rescue with their trustworthy sat nav and GPS and off we went again leaving plumes of dust in our wake until we reached the fantastic Camp La Belle Etoile. I can honestly say it was the best glass of sweet ‘Berber Whiskey’ (mint tea) that we were presented with and that I have ever tasted. The Camp is grouped around a central fire pit with an avenue of traditional tents making up your ‘room’ for the night. Inside there is a double bed covered in a mosquito net and behind two curtains a loo and a shower. The bed is soft, the tent colourful; out of the ordinary indeed – and far more luxurious than I was anticipating! 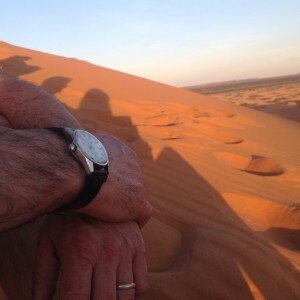 We just had enough time to drop our bags before walking up and out into the Sahara to watch sunset. 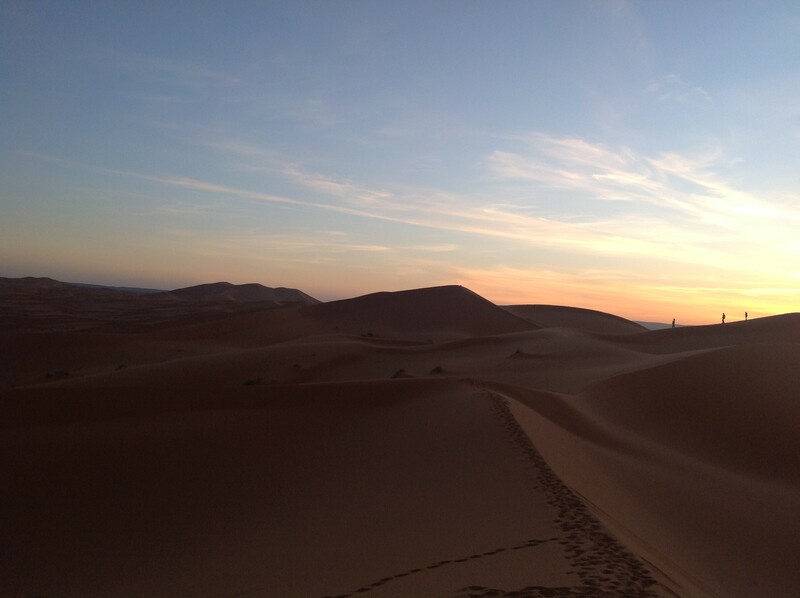 Fifteen minutes or so up dunes and along ochre coloured sandy ridges, before we settling down in small groups on different vantage points to watch a golden sun set over a land that only a few of the group had seen before. We were awe-struck by the sheer chameleon-like beauty of it all. 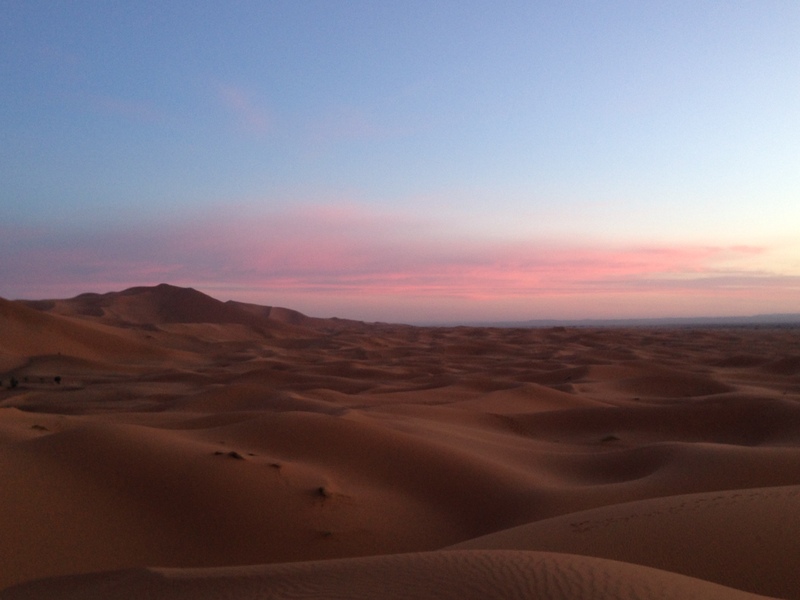 Many of us had been a bit parched and tired on arriving, but as soon as the sky and sand started to change colour and depth, that all soon dissipated as we let the beautiful aura and silence of the desert gently wrap itself around us. We all had the most wonderful night. After feasting on traditional Berber food including delicious sweet/savoury ‘pasties’ (or Berber Pizza’s as they were introduced) we were entertained around the fire pit. Unlike the previous experience in Marrakesh which felt a bit Disney-esque, this was completely authentic and soon the rhythmic sound of singing and the beating of drums and percussion instruments (large castanet-type cymbols) had got most of us off our feet and dancing around, clapping and grinning from ear to ear. When this all calmed down a number of us strolled up the dunes to lay on our backs and just look at the stars above (or below?) us. The previous days temperature and fallen away and the sand was cool to touch, like water. We managed to get back into the tent just as the lights most definitely went out at 11.30 as the generator stopped and we were plunged into a total and instant silence and darkness. Below is a video comilation of footage from this year’s rally. 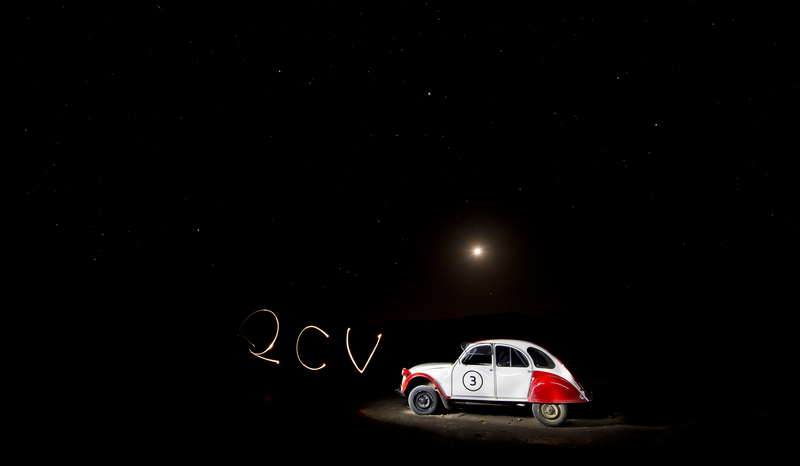 See the 2CVs amidst the glory and majesty of the Moroccan landscape.